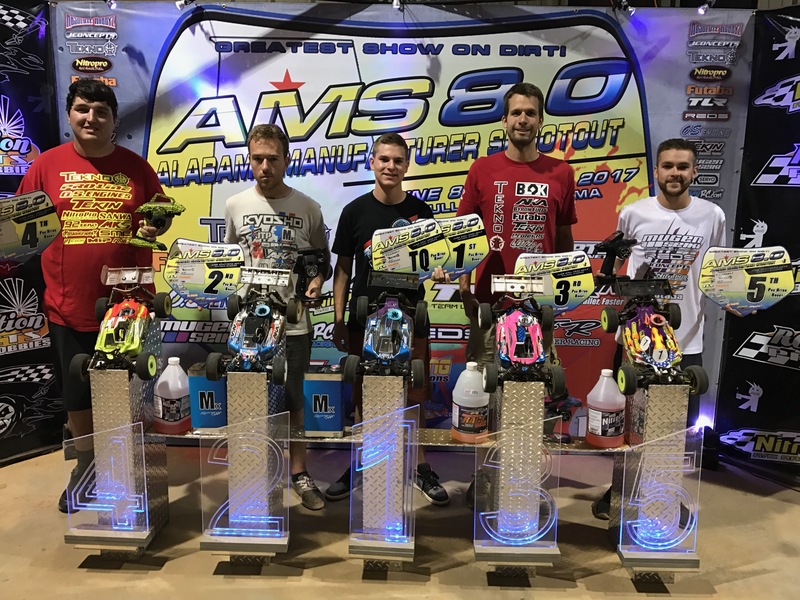 After the AMain Manufacturers World Cup, I had one day at home to prepare to head out to Alabama for the AMS 8.0. It had been quite a few years since I have attended the AMS race, so I was excited for the trip. Wednesday would be along travel day, leaving my house at 11am, catching my 1pm flight to Houston, then a few hour layover before flying to Birmingham and landing a little after 7pm. The track in Culman was another hour drive, so after 8.5 hours or so, we were there. Thursday morning would be practice from 6am to 4pm with 5 minutes runs during that time. I was able to get quite a bit of track time and was feeling good. Bobby Moore built a great layout and it was really fun to drive, but with 20 cars in practice at times, it was super crazy out there. The track was all about tires, so I tried a bunch of different tread patterns and also different compounds. The grip was also getting higher as the day went on, so we were trying to judge if the faster lap times were from tires or just the track gaining traction. At 4pm the track would close and then 4:30pm Q1 would start. I raced 1/8 Pro Electric Buggy, 1/8 Pro Nitro Truggy, and 1/8 Pro Nitro Buggy, and that would be the order of my runs. The track was changing quite a bit and most of the fast drivers were running Clay compound tires. I felt the Clay was better at that time, so that was my plan for my buggy runs. Q1 : Electric Buggy : I went out on AKA Clay Typo’s. My run didn’t really start that great, never got into my flow. The Typo didn’t feel that great either with all the dust, I had too much grip in the sections that had no dust, and very sketchy grip in the more dusty sections. I was still on a time that would have been 4th or 5th, but I made a big mistake on the left side of the track towards the end and would lose 5 seconds and get 9th. Nitro Truggy : With not having Clay as an option in Truggy, I went with AKA Soft GridIron2’s. I didn’t start out the fastest, but my pace was good. Each lap I seemed to get faster and was leading the heat a few laps in and running faster laps than I have done all day. Ryan Lutz was in my heat and we were battling, but I had a second on him most the heat. With a couple laps to go I made a small bobble and he took the lead starting the final lap. I drove confident and pushed on the last lap to take the TQ by a couple tenths, which felt great! Nitro Buggy : After how much grip and speed my Truggy had, I decided to run the same tire on my buggy, AKA Soft GridIron2’s. Right away it didn’t quite feel as good as my truggy did. I made a few bobbles early and had tons of traffic the whole race, but not really great speed either. I got 5th for Q1. Day two would have all qualifying with Q2, and Q3 being ran, with your best two qualifying points being used to place you in the Finals on Saturday. During the night though, a water hose had busted and flooded the right side of the track. Luckily somebody that was camping by the track woke up and walked by the track at 3am and noticed the flood. They got it cleaned up and only started the race program 30 minutes late. Great job track crew! Q2 : Electric Buggy : I decided to go back to the Clay tires, buy this time run AKA Clay ChainLink’s. My grip felt better and my car was much more consistent to drive. I was running faster, but I still didn’t quite have the pace as the drivers battling for the TQ position. I had the leader catching me, and I was trying to go as fast as I could, but then I made a small bobble, which cost me some time. I finished 5th. Nitro Truggy : With the great run in Q1, I wanted the same in Q2. I ran the same exact set of tires and left my Kyosho STRR Evo2 the same as well. I didn’t have that raw speed I had in Q1, but I was still on a decent run, running a time to put me 5th for the round. With a couple laps remaining, I went to turn at the end of the front straight, and my truck just went straight. My servo horn fell off. Complete mistake on my end, took it off before practice to set my servo straight and never tightened it tight. I normally losely tighten it while the car is turned on, not wanting to strain the servo with the power on, then turn the car off and tighten the horn down really tight. I forgot the second step. 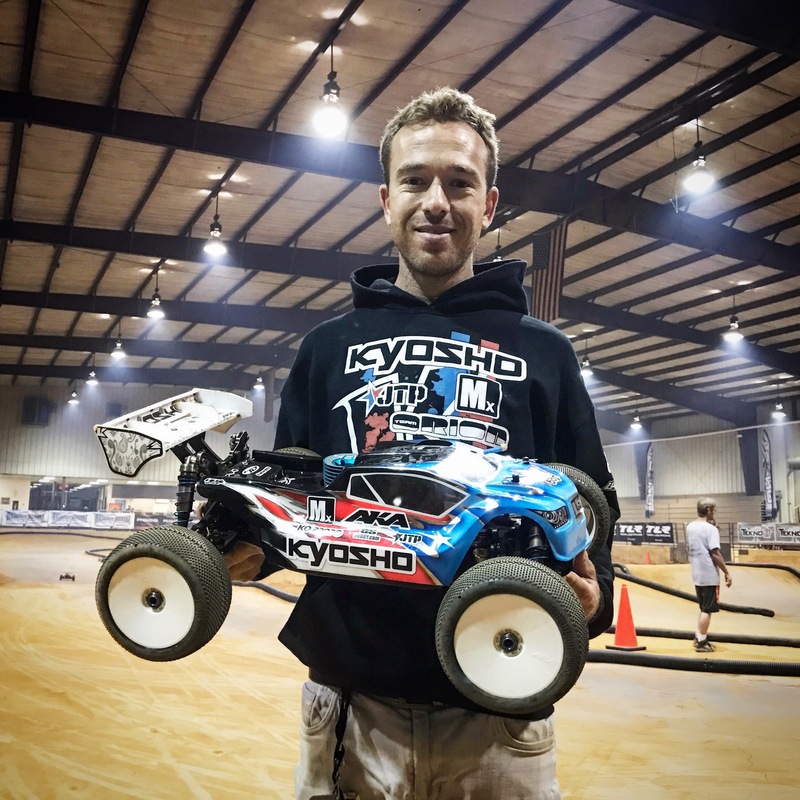 Nitro Buggy : I went out on the same set of tires that I ran on my Electric Buggy and my confidence was higher and my Kyosho MP9 TKI4 felt great. I drove well, had a clean run, with some crazy close calls in traffic though, and took the TQ. 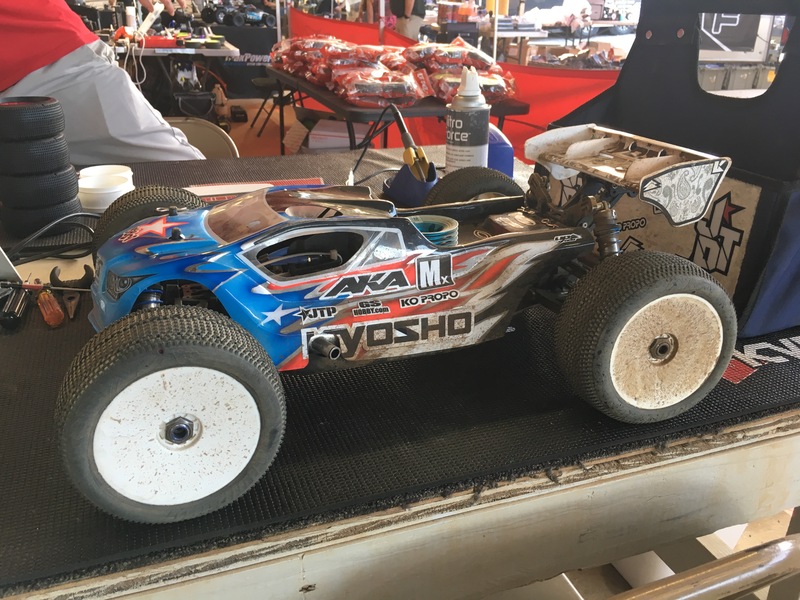 Q3 : Electric Buggy : After my good run in Nitro Buggy, I ran the same set of AKA Clay ChainLink’s again on my Kyosho MP9e TKI4. The track felt like it was still changing quite a bit, getting more dry and grooving up more, but the dust wasn’t going anywhere. I had decent pace, but not the pace I needed to battle up front the whole run. I ended up 5th again. 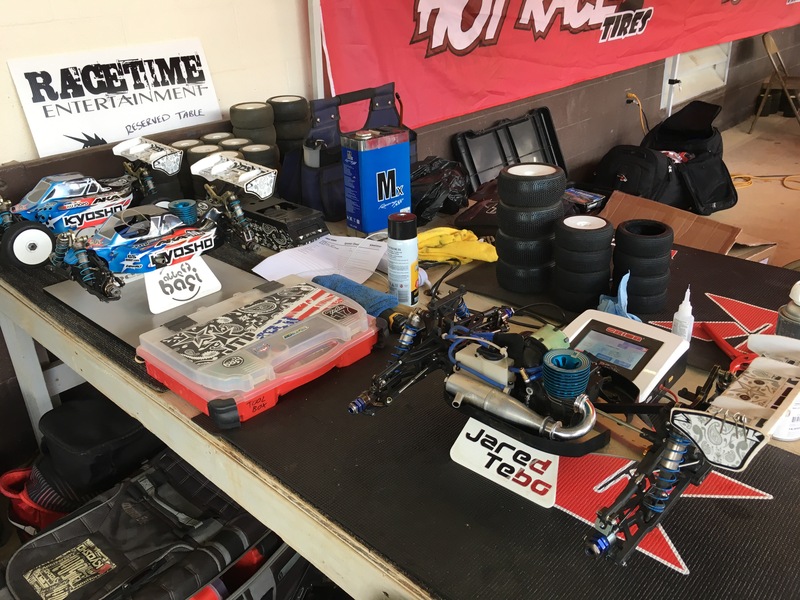 Nitro Truggy : With a TQ and a DNF, I needed a good finish to just get into the Final, but also get a good starting position. I felt like the track was getting more traction and the tires I have been on were not the correct ones. I rooled the dice and went with a much stiffer tire, AKA Soft Long Wear Impact. As soon as I did the first turn, I knew my choice was perfect, the tire had support and the truck felt nimble and fast. I battled for TQ the whole run and was going awesome, but then disaster struck! With 2 laps to go, I hit the brakes really hard before a roller, and my truck didn’t slow down like it should. I thought, that was weird … then my left front wheel shot off. At first I kinda pulled to the side, but I need a decent run, so I kept going. I was able to make it around 2 laps with three wheels, losing about 6-8 seconds a lap and finished 12th for the round. I was bummed because I was going to start 2nd, but atleast I could finish and go straight into the main. Nitro Buggy : After having the great feeling on the Sotf Long Wear Impact in Truggy, I ran the same in Buggy. I started off really fast and me, Rivkin, and Lutz were battling for the lead and going really fast. The last 1.5 minutes though, Lutz was starting to catch me on track and my tires started to get hot it seemed. He caught me and I had to pull over and let him pass, so I had to settle for 3rd. Saturday would be the Final Day. They would run triple 10 minute mains for Pro Electric Buggy, and single 30 minute mains for Pro Nitro Truggy and Buggy. The track was looking even more high traction on Saturday, so I figured the AKA Soft Long Wear would be the best compound. Pro Electric Buggy A1 : Starting 6th, I knew I would have the pace to battle up front, but I needed clean starts in the mains. I went out on AKA DoubleDowns and my car felt great in the warm up laps. My first lap was good, I made one pass and started the second lap in 5th. Coming onto the front straight to start lap 2, I went on two wheels a little, then when I turned into turn 1, I went on two wheels again. I corrected and rode the car on two wheels until I smashed the pipe and flew off the track. There was no marshal and I went to DEEP last. I was so mad in my head and just decided to push hard and race towards the front, I had no other choice. I was over 2/3 of a lap down from the leader Bornhorst as I started lap 3, but I kept that gap the same the entire race, actually cutting that gap down at the end. I picked my way through traffic and was in a battle for 3rd with two laps remaining. Rivkin seemed to have his tires go away and my pace was much faster, but I didn’t drive aggressive enough and checked up WAY too much trying to get a clean pass. I ended up 4th, but I had a lot of confidence after that race. 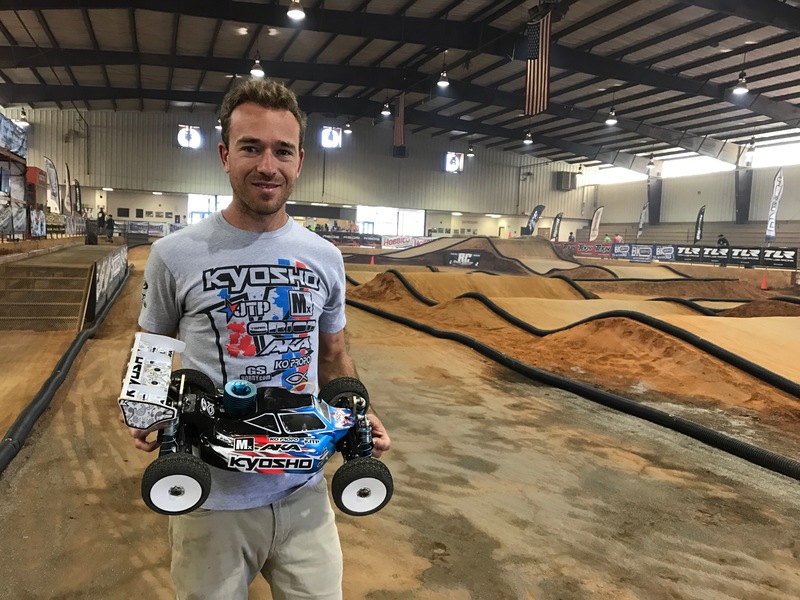 Pro Nitro Truggy : I kept the same tire setup as Q3, AKA Soft long Wear Impact and knew my pace would be good. I got a good start and moved up from 6th to 5th on lap 1 and set my eyes on the leaders. I then moved quickly into 3rd and the race was on between myself, Lutz, and Rivkin. The pace in the main was unreal, as we were driving really fast lap times and not making mistakes. I stayed a few seconds out of the lead battle for most of the race, and I had two small bobbles where I got onto the pipe after the triple. I ended up finishing 3rd and was happy with my driving and my race. Pro Electric Buggy A2 : I was feeling very confident for this race as my pace was crazy fast after being so far back in A1. This time I had a great start and worked my way into second after a few laps. Bornhorst had the lead and he was too far for me to catch him, but I was comfortably in second and driving confident. With about 1.5 minutes left, I started to look around and think too much. I was thinking about the guys behind me and trying to see if they were catching me, and took my mind off my own race and it cost me. I made a STUPID mistake over the right side table top and crashed, dropping from 2nd to 4th. I was really mad at myself and mad that I seem to not have that confidence that I used to have. Pro Nitro Buggy : After the Electric A2, I was very fired up in my mind and I wasn’t going to accept anything other that a victory. In my mind, I was the best driver, my car was the best handling car, and my tires were the best. Right after the start, you could just tell that Rivkin and I both wanted the win bad! We just checked out and dropped the rest of the field and our pace was crazy fast. I ran in second, about a second back for the first 6 minutes, but then made a pass on Rivkin and took the lead. The crowd around the track cheered and that felt AWESOME! I haven’t been happy with my driving and my mindset lately, and it felt great to have the fight back. I lost the lead after the first pit stop, but I was still right there. We just stayed about the same coming into the final 8 minutes of the main and the final pit stop. Rivkin came in before me, handing the lead over, but that same lap, on the big step down on the left side, I pushed too hard and crashed. I had to get marshalled and that was a terrible section to crash in. I got going and still had the lead, but after I came in to get fuel, I had dropped back about 4 seconds. I put my head down and just focused on my own laps and trying to catch him a few tenths at a time. With a few minutes remaining, I had the lead down to around 3 seconds I think, and then I crashed in the same spot again. After that crash, the timing was much worse as there were cars going through the section and the marshall couldn’t get me as fast, I was over 10 seconds back. I would finish strong and get the gap down to around 7 seconds, but the win was out of reach and I finished 2nd. I was super mad at myself and mad that I took my chance away with those two mistakes. I had that confidence and I had that fight, which felt good, but with that, comes the anger after you don’t get what you had felt you wer capable of. That’s the battle for me mentally, do I accept a loss, which makes some people happy, or do I not accept a loss, which makes me drive better and gives me better results, but is much harder for fans and people to understand. I was pretty mad for a while, but I eventually cooled down inside and got prepared for my final race of the night. 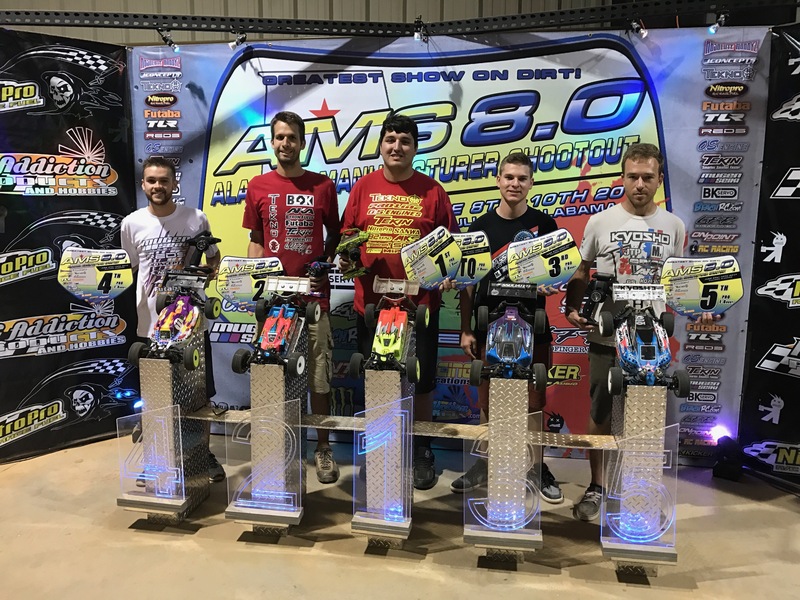 Pro Electric Buggy A3 : I wanted to end the event on a high note and drive a good race and get a result I felt like I deserved. I knew I needed to win or get 2nd to try to get an overall podium. I got another great start and worked my way into second after a few minutes of the main. Bornhorst had a bit of a lead, but I was running smooth in 2nd and was trying to focus on my own race. I started to think a little too much and look around behind me, which is not the smart thing to do. I was looking behind and driving with my perifriael and I jumped wide on the triple, losing time and then having Ogden all the back of me. I crashed off the big table top shortly after, just like in A2 and went from 2nd to 4th. That was towards the end of the race and again I didn’t get the result I felt like I should have gotten. 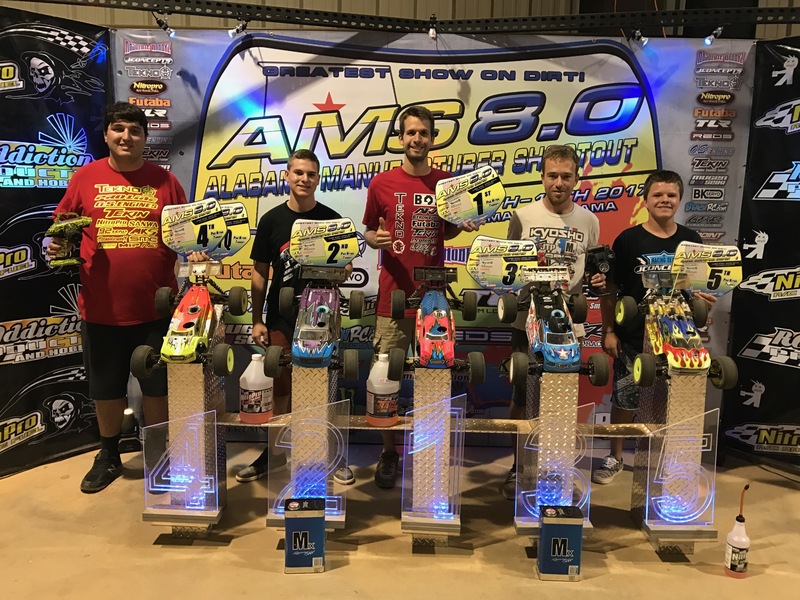 Thanks to Anthony Westergard and Joe Pillars for the great pit stops, my Family for the support, my fans, Kyosho, MX, Team Orion, AKA, Ko Propo, GS Hobby, JTP, Upgrade-RC, TD Paint, Lunsford, MIP, and the Godd Lord Jesus Christ. 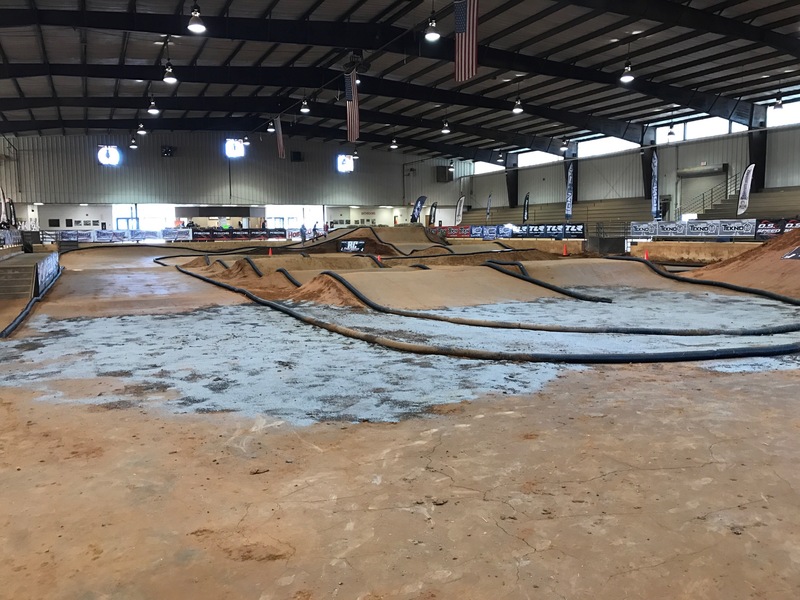 Thanks for reading, and I will be ready to rock in a week for the 1/8 ROAR Nationals! God Bless!